Arsenal were made to work hard for their victory against Birmingham in the WSL on Saturday afternoon. 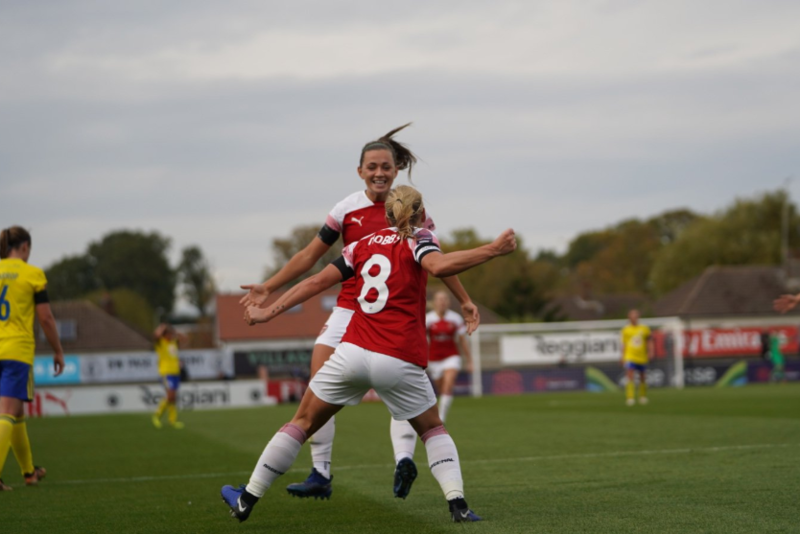 Arsenal continued their fantastic start to the season as they won a seventh straight game in the WSL, recording a 3-1 victory over Birmingham at Meadow Park. Jordan Nobbs was again among the goals as two strikes from herself and one from Danielle van de Donk sealed victory following Emma Follis equalising finish for the Blues. Speaking after the game to VAVEL UK, Nobbs commented on the performance of the team against Birmingham and her own individual displays so far this season. No team this season had proven a difficult task for Arsenal. That was until Birmingham City arrived at Borehamwood. The Gunners have scored 33 goals in just seven matches this season, including a rampant 5-0 win over the current holders of the WSL, Chelsea. But Marc Skinner's side weren't about to let a free-flowing Arsenal team make light work of them. They held their own for more than three-quarters of the match, something which Nobbs was quick to praise. "I think they were one of our toughest challenges yet," she admitted. "Birmingham were great today, especially in the first half. They play very well out from the back and I think their keeper is very controlled on the ball," Nobbs added. Arsenal have started matches this season on the front foot but struggled at times throughout the first period to really going against the Blues. "Joe [Montemurro] was a little frustrated with us at half time - we didn't get our press right so in the second half we changed that and fixed it quickly," Nobbs revealed. The Gunners finally broke the deadlock on 59 minutes, but just moments later Birmingham hit back quickly. It was a test of Arsenal's resolve to pick themselves up and then go onto win. They had to play in a different way than they've been used to, but it was an examination they passed with flying colours. Nobbs stated: "Right now not every game is going to be easy and with our past few wins of such high scoring, it's about digging deep when sometimes you're not as clinical or you're playing a tough team." Arsenal came into the season after failing to match Manchester City and Chelsea in the last few campaigns but this time it is the Gunners leading the pack, boasting a 100% record so far. "We want to win the league. That's hopefully shown in our performances and hopefully in these games," the midfielder commanded. A host of Arsenal players have been on the score-sheet on a regular basis this season, one of which has been Nobbs herself who now has eight strikes this campaign. She opened the scoring for her side after Beth Mead's through ball before then completing the scoring with a lovely finish from the edge of the area in injury time. "Joe has me higher up the pitch, pressing higher and getting in the box," Nobbs said. The 25-year-old's ability to arrive late in the penalty area has been exemplary this term, something which she accredits to working hard on her timing: "I think it's just me working harder on my timing of movement. I think it's so crucial - the timing of getting in the box and the timing of your movement on the ball has got to be on point to score goals in this league." Arsenal initially missed Kim Little in the first half who was outstanding before suffering a broken leg against Chelsea. In her absence, Nobbs has had to step up even more whilst taking on the captain's duties. "We can't wait for Kim to be back and she is a phenomenal world-class player. Any moment I get to be captain of this club is an honour. I've been here for nine years now so hopefully, that shows the love and passion I have for this club," she asserted. There's been considerable talk about Arsenal's forward line but also deserving of the plaudits is midfielder Lia Walti. The Swiss international arrived from Turbine Potsdam in the summer and has had a major influence on Arsenal's play: "She's allowing us to be more fluid higher up the pitch. She wins the ball back well and keeps it," Nobbs noted. This was particularly evident against Birmingham where Walti performed intelligently in front of the back four when Arsenal were under pressure. She swept up the play confidently in the middle of the park and was the catalyst for allowing her team to get back in possession. Nobbs concluded: "It's a very hard role to play. She's been crucial in allowing us and myself to get in the box and you can trust that she's going to be behind us winning the ball back." Arsenal's skipper on the day will now head off on international duty but when the Gunners return to WSL action they will face the challenge of Everton on November 18th.